A leading international polling monitoring organisation claims it’s not confident there wasn’t any tampering in yesterday’s election at polling booths. The vice president of People’s Election Network listed a number of election irregularities reported by some of their volunteer observer network raising doubts about the Election Commission’s efficiency. They say they had 600 observers out amongst polling booths throughout the day. “I’m still reluctant to say I’m confident this election will be in order,” she said on Khaosod English. But she believes that most of this was caused by confusion or lack of experience, not malicious attempts to tamper with the voting. In one serious report of vote tampering a video news report suggested improper vote manipulation by the army. 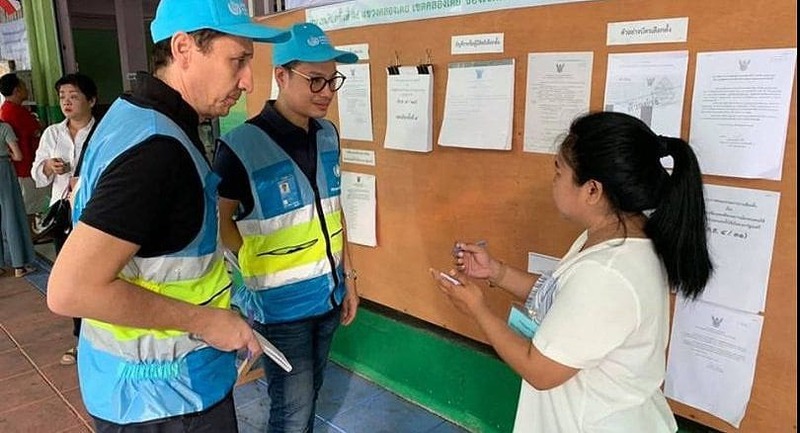 In a Thairath TV reporter’s clip, a military officer is seen inside the polling area watching each of his subordinate vote in Bangkok’s Phaya Thai district. Counting continues today. Phalang Pracharat and Pheu Thai lead the way. Thanathorn Juangroongruangkit, the leader of Future Forward Party, says he’s confident he won’t be penalised by the Election Commission over allegations he breached the Constitution and the election by holding shares in a media company, V Luck Media, when registering for the March 24 election. Thanathorn says he will submit his defence with the commission by next Monday and insists on his innocence. Thanathorn is dismissing the possibility that he could be penalised by the EC by being barred from running in elections for one year, leading to his being disqualified as an MP. The commission sent Thanathorn a formal notice on Wednesday that he was charged for breaching the Constitution and the MP election law after he was allegedly found to be in possession of 675,000 shares in the media firm when he registered his election candidacy. Thanathorn was given seven days to respond to the charge. The Future Forward Party came in third place, behind Pheu Thai and Phalang Pracharat, and ahead of the Democrats, in votes from the March 24 poll. The party was only formed in the last year and put up the fiery 41 year old as its leader and prime ministerial candidate. The Thai Election Commission yesterday unanimously resolved to press charges against Thanathorn over an alleged violation of Thai media shareholding rules. Citing investigations by two EC panels, Sawang Boonmee, the EC deputy secretary-general, told a press conference that Thanathorn had allegedly violated the law by owning or holding 675,000 shares in V-Luck Media Company while registering as a candidate for the general election. “Thanathorn’s share certificate number is from 1350001 to 2025000,” said Sawang, referring to the findings of two panels the EC had set up to investigate the case. Thanathorn has been accused of contravening the electoral laws that state a shareholder in a media company is barred from contesting an election for member of parliament, according to the EC. The action is punishable by disqualification. The case was filed by Srisuwan Janya, secretary-general of the Association for Protection of the Thai Constitution, on March 25. 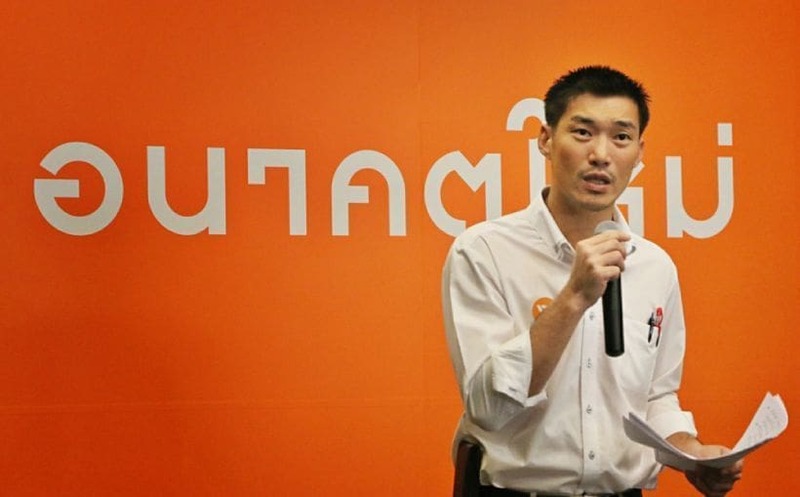 An EC source said the agency had yet to suspend Thanathorn’s right to contest in elections for one year or give him an “orange” card, as it was just an initial charge. Thanathorn will have seven days to give testimony or submit documents in his defence to the EC, Sawang said, adding his lawyers would also be allowed to witness the trial. After the testimony, the EC will finalise the case as soon as possible in order to finish it before May 9 when it will announce the election results. Thanathorn, whose party is tipped to win around 80 MP seats in the new lower house, was on the way back from his tour to Europe. He posted on his Facebook page yesterday that he had been notified to quickly return to Thailand to face an “unexpected incident”. Future Forward secretary-general, Piyabutr Saengkanokkul has questioned the EC’s decision, saying the poll agency needs to wait until Thanathorn is endorsed as an MP before it can question his qualification. 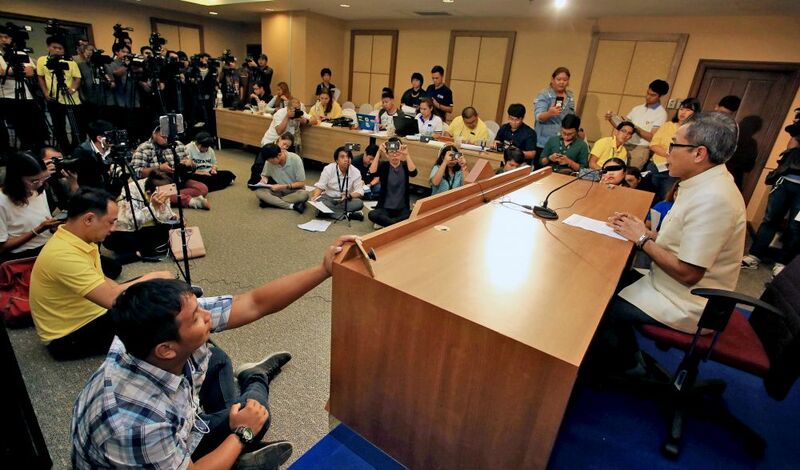 Meanwhile, Raksagecha Chaechai, secretary-general of the Office of Ombudsman, said the EC had until today (Wednesday) to submit an explanation to the office regarding a petition seeking an annulment of the March 24 election. The office last week resolved to accept the petition filed by the now-defunct Thai Raksa Chart Party’s former MP candidate, Reungkrai Leekijwatana, who asked the office to submit its opinion to the Administrative Court or the Constitutional Court regarding whether last month’s election should be annulled. Leader of the New Economics Party Mingkwan Sangsuwan hasy reiterated his party’s intention to join with the pro-democracy coalition (Pheu Thai, Future Forward) and against the pro-junta party, Phalang Pracharat. 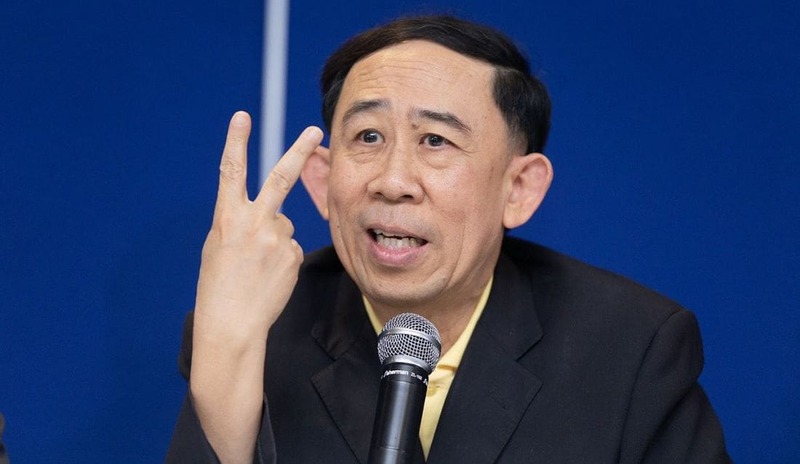 Amid uncertainty over which camp New Economics would work with after the election, Mingkwan has clarified he would not join with Phalang Pracharat because of “ideological differences”. Six New Economics candidates were elected in the March 24 poll. Mingkwan gave assurances at today’s press conference that none of the new MPs would defect. The party’s deputy leader, Supadit Argadriks, also repeated the party’s intent to help uphold democracy with a constitutional monarchy, and live up to its pledge to voters. Some of the party’s members yesterday petitioned the Election Commission to dissolve the party, alleging it had fallen under outside influences related to powerful business interests. But the deputy leader insisted today that the party was united. He said the complaint had stemmed from a misunderstanding. Supadit said legal action would be taken against the plaintiffs who filed the petition with the EC.